Holy hair metal! '80s metal icons Dokken have returned, complete with the sounds that made the outfit one of the progenitors of the metal scene. HELL TO PAY showcases a band with a lot of gas left in the tank, as songs like "Don't Bring Me Down" and "Haunted" emanate with guitar hero flare, thanks to the fretwork of Jon Levin. Even though George Lynch and Jeff Pilson are no longer charter members, the band still can kick it up with the kind of firepower other '80s bands seem to have lost, amply shown on the driving "Better Off Before". And yes, there are a handful of touching ballads here, suitable for crying over lost love, such as the Beatles-esque "Letter to Home" and the tender acoustic tune "Care for You". Maybe Don Dokken doesn't realize it's not 1988 anymore, but who cares? 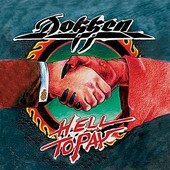 Dokken hasn't sounded this rejuvenated in a long time, and those that yearn for the days of carefree rock 'n' roll should really enjoy this release. Dokken: Erase the Slate Dollar Store Cowboys: And The Horse They Rode In On. . .